Cultural leaders behind the plan to create a giant bronze sculpture in Plymouth have come face-to-face with her in foam form as work gets underway. 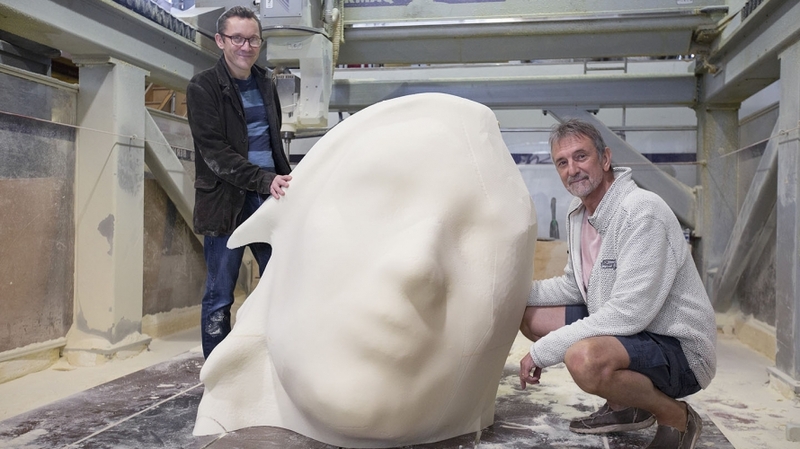 Craftsmen have begun the lengthy process of cutting, moulding and casting ‘Bianca’, as she is commonly known, in to what will become a unique and striking piece of public art for the city. Around 150 individual sections will be cast in bronze and then welded together to create the eye-catching sculpture depicting a dynamic and powerful woman. The finished sculpture will measure seven-metres (23ft) tall and nine-metres (30ft) wide and is scheduled to take up residence outside the Theatre Royal Plymouth in late 2018/early 2019. Cornish-born artist Joseph Hillier was commissioned by the Theatre to create the dramatic sculpture to complete its £7.5million regeneration project. Plans were approved by Plymouth City Council in February and work on the project began last month. Joseph and Adrian Vinken, chief executive of the Theatre Royal Plymouth, recently visited three factories involved in creating the sculpture to see Plymouth’s new resident taking shape. First stop was Bakers Patterns Ltd in Telford where ‘Bianca’s’ face was carved from a giant block of polyurethane foam in order to make a mould. John Baker, company owner and managing director, said that Joseph’s 360-degree Computer Aided Design (CAD) of ‘Bianca’ was broken down into more manageable sections before each part is then carved into foam using a giant machine with a jumbo drill bit revolving at 7,000 times a minute. Each finished foam section is then carefully transported to Liverpool where Castle Fine Arts Foundry create silicon moulds. These are then taken to company’s foundry in the tiny village Welsh village of Llanrhaeadr, where the bronze casting process begins.